Japanese developers have unveiled an electric car they said Wednesday can travel more than 300 kilometres before its battery runs flat. Electric vehicle specialist SIM-Drive, have relaunched the car they hope to take to market by 2013. 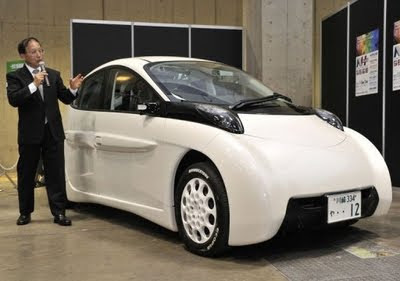 The four-seater "SIM-LEI" has electric motors inside each wheel and a super-light steel body shell, allowing for 333 kilometres (207 miles) of motoring on one charge in a JC-08 mode test, which represents general urban traffic condition in Japan. The cars battery capacity is 24.5 kWh which is approx the same as the Nissan Leaf. Electrical power consumption during the JC-08 test was 77Wh/km. (for comparison, a Nissan LEAF consumes 120Wh/km in JC-08 mode) The test results prove the SIM-LEI with it's 4 direct drive in-wheel electric motors achieved almost double the range of the Nissan Leaf using the same capacity battery pack. This has enormous implications for the global EV market. The previous launch date for this car in March of this year had the unfortunate coincidence of being at the same time the earth quakes hit Japan so the launch was scaled down as a mark of respect. The CEO of SIM-Drive is Hiroshi Shimizu, a Keio University Professor who also developed the Eliica Electric Supercar.